Today is Small Business Saturday and in honor, Rae’s Cafe is giving YOU up to 40% off our line of gourmet coffees and teas! We’re also doing FREE shipping on orders over $50, just use coupon code: SHIP50. If you have any questions, please contact me through email or my business number on website. Have a wonderful holiday weekend!!! We’ve written before about some of the amazing health benefits of green tea — it can help with cardiovascular health, lower blood pressure, boost the immune system, promote longevity, fight against aging, improve brain function and concentration, and even help to ease anxiety. A recent study has also shown that green tea appears to boost the activity of DNA repair enzymes. 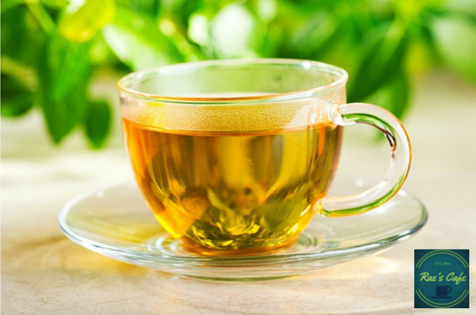 Researchers have long reported health benefits in green tea drinkers, but for this new study, Iris Benzie and her colleagues at the Hong Kong Polytechnic University monitored the activity of DNA repair enzymes in lymphocytes shortly after people drank a cup of green tea, and again after study participants had been drinking two cups of green tea each day for a week. The team found that an enzyme (known as “hOGG1”) which is critical for fixing DNA damage from oxidation, and another enzyme that protects against such damage, were more active after the 16 study participants drank tea compared to when they drank just water. The team also found 30 percent less DNA damage in lymphocytes 60 minutes after participants had drunk a cup of tea. According to Benzie, the finding “opens up a whole new avenue to look at the molecular mechanisms”of green tea’s effect on cells. While only a preliminary study, these new findings again reveal that green tea is definitely beneficial, and there’s science to prove it. Thankfully, we love Organo’s Organic Green Tea so much, we don’t need science to tell us to drink more — but the data sure does help! It offers a seemingly simple natural sweetness to one of our favorite products, Organo Gold Black Ice, which of course is iced black tea flavored with natural honey. Yet there’s nothing simple — but everything natural — about honey. We thought we’d take a look the effort behind this miraculous ingredient. To produce a single jar of honey, foraging honey bees have to travel the equivalent of three times around the world. 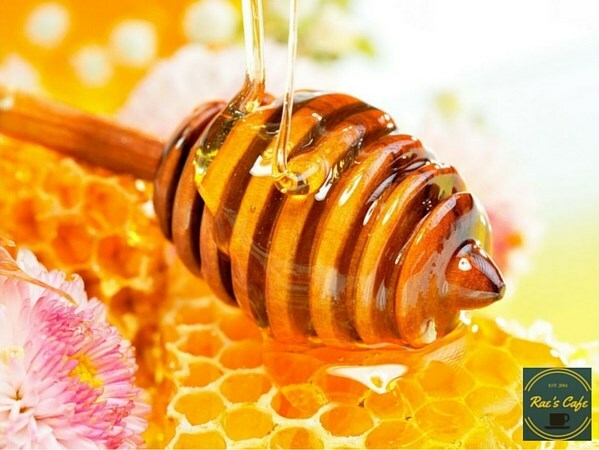 The average bee will produce only one twelfth of a teaspoon of honey in its lifetime! Honey stored in an airtight container will never spoil. Sealed honey vats found in King Tut’s tomb still contained edible honey, despite over 2,000 years beneath the sands. Honey bees have 170 odorant receptors, compared with only 62 in fruit flies and 79 in mosquitoes. Their sense of smell is so precise it can differentiate hundreds of different floral varieties, and tell whether a flower carried pollen or nectar from meters away. A honey bee visits 50 to 100 flowers during a collection trip. Bees must visit approximately two million flowers to make just one pound of honey. The honey bee’s wing stroke is incredibly fast — about 200 beats per second, which is what produces their distinctive buzz. A honey bee can fly for up to six miles, and as fast as 15 miles per hour. A colony of bees consists of 20,000-60,000 honeybees and one queen bee. Worker honey bees are female, live for about six weeks, and do all the work. So — the next time you enjoy a refreshing cup of Black Ice, think about all of the effort that goes into making that tiny dash of honey that adds a lovely natural sweetness to this amazing beverage! Tuesday, we looked at how tea arrived in Japan, by way of Buddhist scholars who brought it back from China in the early 800s. Since then, tea has grown to become an important part of Japanese culture. Here’s a look at how tea became such an integral and popular item in Japan. In 1740, Soen Nagatani developed Japanese sencha, an unfermented form of green tea. 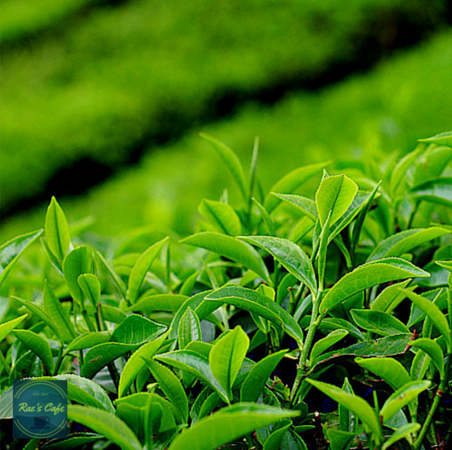 To prepare sencha, the tea leaves are first steam-pressed, then rolled and dried into a loose tea. The dried leaves are brewed with hot water to yield the final drink. Sencha is now one of Japan’s mainstay teas. The other more traditional type of green tea in Japan is matcha, the finely powdered green tea that is the focus of the Japanese tea ceremony. Matcha is prepared using shade-grown tea leaves that are rolled, laid flat to dry and then stone ground to form a bright green, fine powder. At the end of the Meiji Era (1868–1912), machine manufacturing of green tea was introduced in Japan, and began replacing handmade tea. Machines took over the processes of primary drying, tea rolling, secondary drying, final rolling, and steaming of the tea leaves. The first time tea was exported from Japan was in 1610, by the Dutch East India Company from Hirado, Nagasaki. In 1859, when the ports of Nagasaki, Yokohama and Hakodate were opened to foreign trade, tea became one of Japan’s main export commodities, with an estimated 181 tons of tea exported in that year alone. The three largest producing regions for Japanese tea are Shizuoka, Kagoshima and Mie. Shizuoka, which is located in the area between Mt. Fuji and the Pacific coast west of Tokyo, accounts for around 40% of Japan’s annual commercial tea production. While Japanese culture is now renowned for the elaborate tea ceremony that developed over thousands of years, in today’s fast-paced modern culture, convenience is key. So ready-to-drink green tea products, particularly bottled or iced in vending machines, now account for an estimated 20% of all green tea consumption in Japan. Green tea is so ubiquitous in Japan that whenever tea or “ocha” is offered, 99.9% of the time, it is green tea, which of course comes from the same plant as black tea, but does not experience fermentation or oxidization, and instead is steamed soon after being picked to stop the oxidization process. Of course, we at Rae’s Café have always admired green tea, which is why Organo’s Organic Green Tea is one of our most popular products. Obviously, Japan has a long and storied history when it comes to tea. So, we thought we’d take a look at how tea arrived in Japan, and how it became an integral part of Japanese culture over the years. Tea is thought to have been first brought back to Japan from China by Buddhist scholars, who were sent as envoys to learn more about Chinese culture. Ancient texts indicate that the first batch of tea seeds were brought back to Japan by a Buddhist priest named Saicho in 805, and then by another named Kukai in 806. After that, during the latter part of the Heian period (794-1185), Emperor Saga was said to have encouraged the cultivation of tea plants in Japan. At this time, tea was extremely valuable, so it became a drink of the royal classes, and was enjoyed primarily by imperial court nobles and Buddhist monks. In 1191, in the early Kamakura Period (1185-1333), Eisai, founder of the Rinzai sect of Zen Buddhism, brought back a new type of tea seeds to Kyoto from Sung-dynasty China. Eisai was also said to have been instrumental in introducing tea consumption to the warrior or Samurai class. Slowly, green tea became a staple among cultured people in Japan — a brew for the gentry and the Buddhist priesthood, alike. Production increased and tea became increasingly accessible, though was still a privilege enjoyed mostly by the upper classes. The pastimes made popular in China in the 12th and 13th centuries – reading poetry, writing calligraphy, painting, and discussing philosophy while enjoying tea – eventually became popular in Japan, particularly within the Samurai society, and helped spur the development of the tea ceremony. 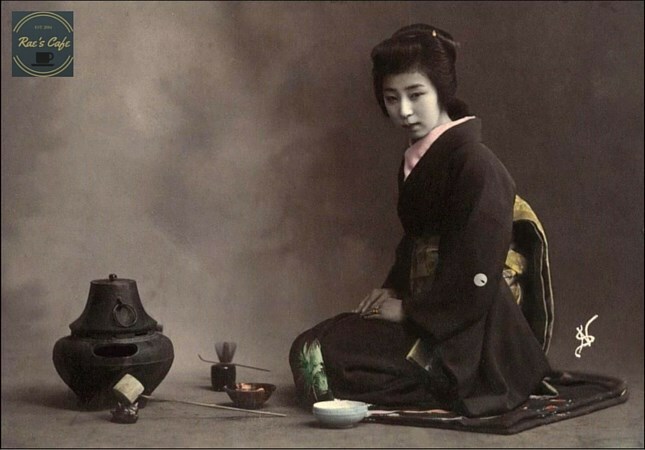 From the late 15th to the late 16th century, tea masters such as Murata Shuko, Takeno Joo and Sen no Rikyu developed a new tea ceremony, referred to as Wabicha. This style of tea ceremony gained a strong following among Samurai, and is the origin of the tea ceremony still practiced today. As you can imagine, there’s so much more to the history of tea in Japan. 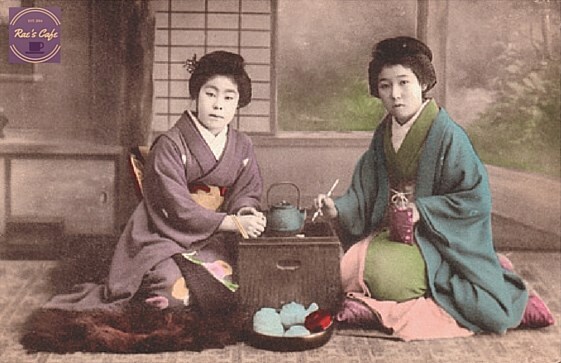 So stay tuned for Saturday’s post, where we’ll look at the next stages in the evolution of tea culture in Japan. Peachtree Street is, of course, the main street of Atlanta, and many are familiar with the expression “She’s a Georgia peach,” — referring to the fruit for which the state of Georgia has become so renowned. In honor of its southern roots, this iced tea is best served in a Mason jar, on a porch, with nothing but Georgia on one’s mind. Here’s to all those who hold Atlanta, Georgia, close to their hearts. Mix up a pitcher of OG Red Tea, add your sweetener of choice and the freshly sliced peaches, then let the tea mixture cool in the refrigerator for 1-2 hours. 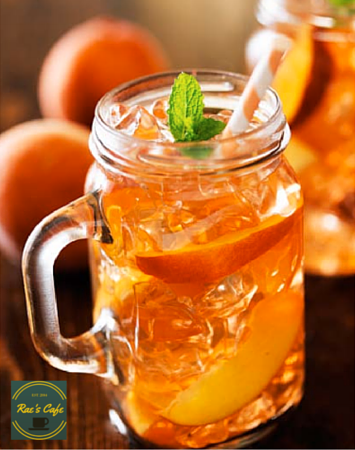 To serve, pour tea over ice cubes into Mason jars for an authentic southern touch, and add slices of lemon and a sprig of fresh mint. You may not be alone if you’re hard-pressed to explain the meaning of the term “tasseography” — but it’s the term given to the art of reading tea leaves. It is sometimes known as “tasseomancy” or “tassology”, and can also be performed using coffee grounds, or essentially any beverage that leaves sediment in the cup. Today, we thought we’d take a look at the history of this practice. Acorn: Continued or improved vitality. Anchor: A symbol of luck, in business or in love. Cat: A deceitful friend or relative. Dog: A loyal friend or relative. Elephant: Good luck, good health and happiness. Heart: A lover. If close to a ring, marriage to the present lover. If indistinct, the lover is fickle. Heavenly bodies (Sun, Moon, Star): Good luck — great happiness and success. Kite: Wishes will come true. Palm tree: Good luck — success in any undertaking. 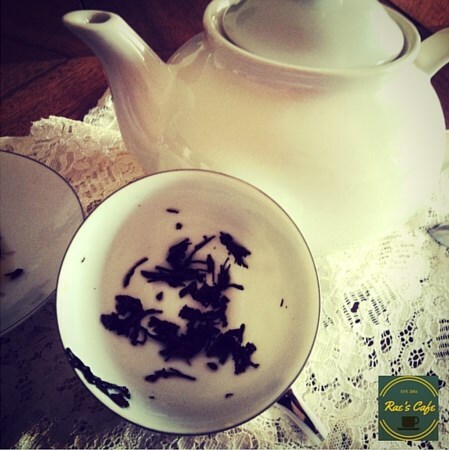 Here at Rae’s Cafe, of course, we firmly believe that there’s a fortune of a more substantial kind to be found in our coffee and tea cups, thanks to our incredible products. But that doesn’t stop us from being fascinated by this ancient art of tea-fueled fortune-telling. Let us all raise a glass of OG tea in praise of good fortunes all around! Sorry I didn’t post Tuesday or Wednesday this week, my computer (with all my files) was teaching me patience and gratitude. Enjoy and have a wonderful #ThirstyThursday!!! 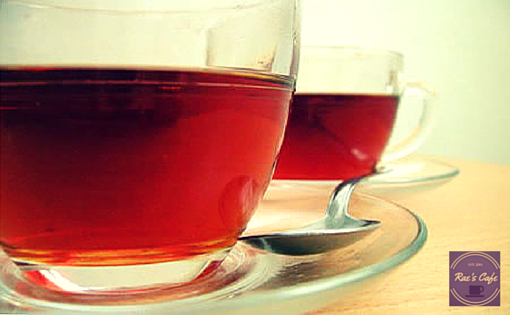 We’ve explained before the semantics of the naming of OG’s Red Tea product. While in the West we generally refer to the color of the tea leaves, and thus call it “black tea” — in China, Korea and Japan, the name refers to the color of the infused drink itself. So, that’s why what some people in Western countries think of as “black tea” is dubbed “red tea” at Rae’s Cafe. Tea is believed to have been discovered completely by accident, way back in 2737 BC. It is said that Shen Nung, the second emperor of China, discovered tea when some leaves from a Camellia sinensis plant (the plant that all traditional teas are made from) blew into his pot of boiling water. The habit of drinking tea leaves steeped in a tea pot didn’t become popular until during the Ming Dynasty (1368-1644). Here’s a timeline that traces the long and storied history of the beverage that is so popular today — from that first accidental leaf right through to the first tea bag. According to legend, the second emperor of China, Shen Nung, discovers tea when tea leaves blow into his boiling water. A Chinese dictionary cites tea for the first time as Erh Ya. Demand for tea as a medicinal drink rises in China, and it is begun to be cultivated and processed. Turkish traders begin to trade for tea from Mongolia. Japanese priests studying in China carry tea seeds and leaves back to Japan. It is rare and expensive and is consumed mostly by high priests and the aristocracy. The Chinese give tea its own character, ch’a. The first book of tea, titled Ch’a Ching (The Classic of Tea), is written. It discusses ancient tea cultivation and preparation techniques. After the Mongols take over China, tea loses its aristocratic status and becomes more popular among the masses. After the fall of the Ming Dynasty with the Mongol takeover, all teas (black, green, and oolong) are easily accessible in China. Steeping whole tea leaves in cups or teapots becomes more popular. Zen priest Murata Shuko creates the Japanese tea ceremony and calls it cha-no-yu (hot water tea). It celebrates the mundane aspects of everyday life. Tea becomes more than just an art form and almost a religion. Europeans are exposed to tea when a Venetian author claims that Asians live so long because of their tea consumption. Tea appears for the first time in an English translation of Dutch explorer Jan Hugo van Linschoten’s papers. He refers to tea as chaa. The Dutch bring back green tea from Japan (though some scholars say it was actually from China). The Dutch East India Company markets tea as a medicinal drink, though only the very rich can afford it. Chinese ambassadors present the Russian Czar Alexis with chests of tea. He refuses it as being useless. The first tea is sold in London, England, at Garraway’s Coffee House, as a health beverage. England’s King Charles II’s new bride, Catherine Braganza of Portugal, is an avid tea drinker and helps make tea more popular and accessible. The first tea is sold publicly in Massachusetts. Thomas Twining transforms Tom’s Coffee House into the “Golden Lyon, the first tea shop in England. In what is known as the Boston Tea Party, a group of Massachusetts colonists dumped several hundred chests of tea into Boston Harbor to protest taxes on tea. Anna the Duchess of Bedford introduces afternoon tea. Tea is planted in and around Darjeeling, India. Thomas Johnstone Lipton opens his first shop in Glasgow, Scotland. Englishman Richard Blechynden invents iced tea during a heat wave at the St. Louis World’s Fair. New Yorker Thomas Sullivan invents tea bags when he sends tea to clients in small silk bags and they mistakenly steep the whole bag. As Rae’s Café expands, sharing our ganoderma-enhanced coffees, teas and other beverages and products with people all across the continent, one of the things that we are proudest of is our organic items. Organo Gold’s commitment to organic farming wherever possible means that several of our best-selling products are certified organic by Ecocert, the global certification body for sustainable development. These organic products — which include Organo Gold Organic Green Tea, Organic Red Tea, Premium King of Coffee, Ganoderma Lucidum Spore Powder, and Organic Ganoderma Lucidum Capsules — are some of Rae’s finest, and represent the pinnacle of what Organo Gold is all about — providing customers with the products they need for an active lifestyle. Twenty-four percent of the world’s organic land is in Europe. The countries with the largest organic area are Italy (1’150’253 hectares), Spain (988’323 hectares) and Germany (865’336 hectares). In 2007, sales of organic products were approximately 16 billion Euros. The largest market for organic products in 2007 was Germany — with a turnover of 5.3 billion Euros, which increased to 5.8 billion Euros in 2008. Germany is followed by the UK (2.6 billion Euros), France and Italy (both 1.9 billion Euros) in spending on organic products. Support for organic farming in the European Union (as well as some of the EU’s neighboring countries) includes grants under rural development programs, legal protection and a European Action Plan as well as national action plans in individual countries. One of the key instruments of the European Action Plan on organic food and farming, an information campaign, was launched during 2008, with the aim of increasing awareness of organic farming throughout the European Union. We look forward to the organic-conscious European community embracing the Cafe’s and our pro-organic ethos, and to sharing Organo Gold’s certified organic products far and wide across the world. This revitalizing tea blends the finest organic red tea leaves with two ingredients long revered in China for their beneficial properties — our signature organic Ganoderma lucidum and Cordyceps militaris — for a cup of tea that is refreshing, uplifting and positively balancing. When Organo Gold references “red tea”, we mean red tea in the traditional Asian terminology. You see, while in the West we refer to the color of the tea leaves, and thus call it “black tea” — in China, Korea and Japan, the characters that make up the literal words “red tea” refers to the color of the infused drink itself. So, that’s why what some people in Western countries think of as “black tea” is dubbed “red tea” in the Cafe family. Another kind of red “tea”, or what is often known in the West as Rooibos tea, isn’t technically a tea, because it comes from an entirely different plant, the Aspalathus linearis or the red bush “Rooibos” plant from South Africa. This isn’t related at all to the traditional Camellia sinensis tea plant, and thus is technically a herbal tea, tisane or herbal infusion as opposed to a traditional “tea”. One of our favorite recipes, using OG Organic Red Tea, is ideal for cool winter days — or can be served iced in warmer climates. We whip up a batch of OG Red Tea, then simply add a few slices of lemon, some lemon zest, a few sprigs of fresh mint and some freshly sliced or grated ginger root. The ginger, lemon and mint add a refreshing flavor, as well as adding nutrients and a bit of “zing”! Serve warm in winter or iced in summer. Dissolve the sachets of OG Organic Red Tea in freshly boiled water. Slice up fresh lemons, and zest some of the lemon rind. Rinse sprigs of fresh mint in water, then slap or crush slightly with hands. Peel a fresh ginger root and slice thinly or grate using a lemon zester or microplane grater. Stir the lemon, lemon zest, mint, and ginger into the brewed tea. Add a spoonful of your favorite honey (or if vegan you can substitute agave or brown rice syrup).